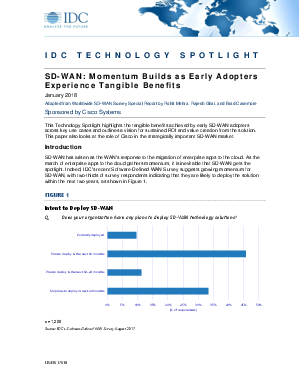 This Technology Spotlight highlights the tangible benefits achieved by early SD-WAN adopters across key use cases and outlines a vision for sustained ROI and value creation from the solution.This paper also looks at the role of Cisco in the strategically important SD-WAN market. SD-WAN has arisen as the WAN's response to the migration of enterprise apps to the cloud. As the march of enterprise apps to the cloud gathers momentum,it is inevitable that SD-WAN gets the spotlight.